As you compare midsize SUVs on the market today and prepare to make a purchase, it makes sense to look ahead to what the new 2020 Hyundai Palisade brings to the table. The Palisade is a new model for 2020, and it promises to impress drivers and passengers with its features, style and capabilities. All aspects of this SUV are modern and fresh, and many of the most innovative devices are loaded into it across various trims. If you are ready to inquire about trim-specific features and availability, now is a great time to reach out to our reputable Hyundai dealership. Before you decide if the 2020 Hyundai Palisade is the right midsize SUV for you to purchase soon, you should spend time learning about the differences between the five trims. You can choose between the SE, SEL and SEL Plus on the lower ends and the Limited and the Ultimate on the higher end. 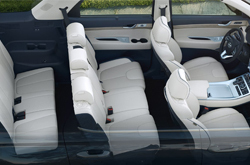 All trims are decked out with innovative features and promise to deliver an impressive experience, and you may be thrilled to learn about the true value that Hyundai has loaded into each Palisade SUV. 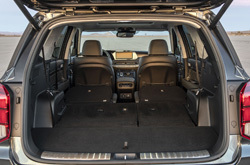 These SUVs offer three rows, so there is ample space for eight people to ride in the Palisade. 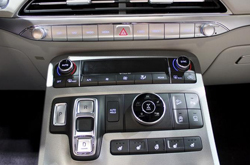 A few of the many items that you and your passengers can benefit from in the 2020 Palisade include a push-button ignition, a proximity key, auto-dimming side mirrors with power adjustment, an integrated roof spoiler, multiple USB ports across all rows, a moonroof or sunroof with power function, a color screen for control of the infotainment system, a hands-free liftgate, HD radio, SiriusXM satellite radio, power-adjusting and heated front seats, fold-flat back rows, cloth or Nappa leather material in multiple color choices, a head's up driver's display screen, active noise cancellation, a leather shifting knob, a leather-wrapped steering wheel with multiple mounted controls and multiple other features. We are available to answer your questions about specific features in each trim for 2020. If you are searching for a powerful, performance-driven SUV, the 2020 Palisade will not disappoint you. All five of the 2020 trims are equipped with the same powerful gas engine. This is a 3.8-liter, Atkinson Cycle, V6 engine that generates 262 feet-pounds of torque with 291 horsepower. It comes with an automatic transmission, multiple driving modes, idle stop-and-go technology and torque vectoring. The Palisade features a front-wheel drive drivetrain or an upgraded all-wheel drive option. A few of the additional features in the 2020 Palisade that affect performance include an independent suspension, traction management, direct fuel injection, stability control, anti-lock brakes and several other components. By adding the optional Class III tow hitch with a 2-inch drawbar, you can maximize the benefit of the Palisade 5,000-pound towing capability. To gather more information about the Palisade's on-the-road abilities, contact our helpful Hyundai sales agents today. Your safety is a matter that Hyundai takes seriously, and this is evident in how well-appointed the 2020 Palisade is with innovative and protective equipment. There are some variations in safety features depending on the trim that you opt for, but all trims are designed with exceptional equipment. 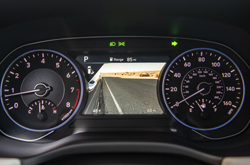 Your 2020 Palisade SUV may be equipped with forward collision avoidance, adaptive cruise control, an advanced airbag system, child safety seat latches and tethers in the back rows, back door child safety locks, accident avoidance with blind spot monitoring, engine immobilization, tire pressure monitoring, a rear occupant alert with ultrasonic sensors, safe exit assist, collision mitigation with the rear cross-traffic alert and several other quality features that promote safety on the road. *Get Today's Price is available to all customers and can also be obtained by calling or coming into the dealership today. Purchase prices do not include tax, title, license and $150.00 doc fee. Prices include the listed rebates and incentives. Please verify all information. We are not responsible for typographical, technical, or misprint errors. Inventory is subject to prior sale. Contact us via phone or email for more details. *MPG Based on 2020 EPA mileage ratings. Use for comparison purposes only. Your mileage will vary depending on driving conditions, how you drive and maintain your vehicle, battery-pack age/condition, and other factors.